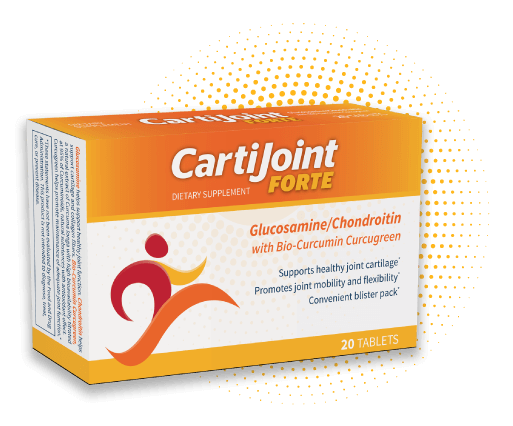 CartiJoint™ FORTE features a bioactive* curcumin extract, which is 100% natural turmeric, Glucosamine hydrochloride and Chondroitin sulfate to support joint health and mobility*. In the human joint, naturally occurring Glucosamine and Chondroitin are important structural components that provide support. Glucosamine is one of the two structural components of hyaluronic acid. In the human joint, hyaluronic acid is a major part of the synovial fluid and an important component of articular cartilage. The unique composition of Curcugreen™ is composed of curcuminoids and an essential oil of turmeric that helps increase free-curcumin availability. Take 1 tablet 3 times a day after each meal with water, or as suggested by a physician. Do not chew. Each tablet contains Glucosamine hydrochloride, Chondroitin sulfate and Bio-Curcumin Curcugreen™ as described in the table below. CAUTION: If pregnant, nursing, on medications, or have a medical condition, consult a doctor before use. The product contains ingredients from shellfish, fish, and porcine sources. Keep out of reach of children. CartiJoint™ FORTE is a trademark of Fidia Farmaceutici S.p.A., Abano Terme, Italy. A wholly owned subsidiary of Fidia Farmaceutici S.p.A.